The internal courtyard has been used in architecture for centuries. From the Roman ‘atriums’ and the Islamic ‘sahns’, to our modern day courtyard – they are a place of privacy and security and are built to assist with climate control. Courtyards have historically been used for many purposes including cooking, sleeping, working, playing, gardening, and sometimes for keeping animals. Interestingly we have read that before courtyards, open fires were kept burning in a central place within a home, with only a small hole in the ceiling overhead to allow smoke to escape. Over the years, these small openings were enlarged and ultimately led to the evolution of the centralized open courtyard that we have today. Courtyard homes are more common in temperate climates, as an open central court can be an important aid to cooling the house in warm weather. The comforts offered by a courtyard—air, light, privacy, security, and tranquillity—are properties nearly universally desired in human housing. The Australian residential courtyard has come a long way since many were used as a service area with a big Hills Hoist located smack bang in the centre. In addition to the comforts noted above, the internal courtyard can make the floor plan of a house varied and more interesting. 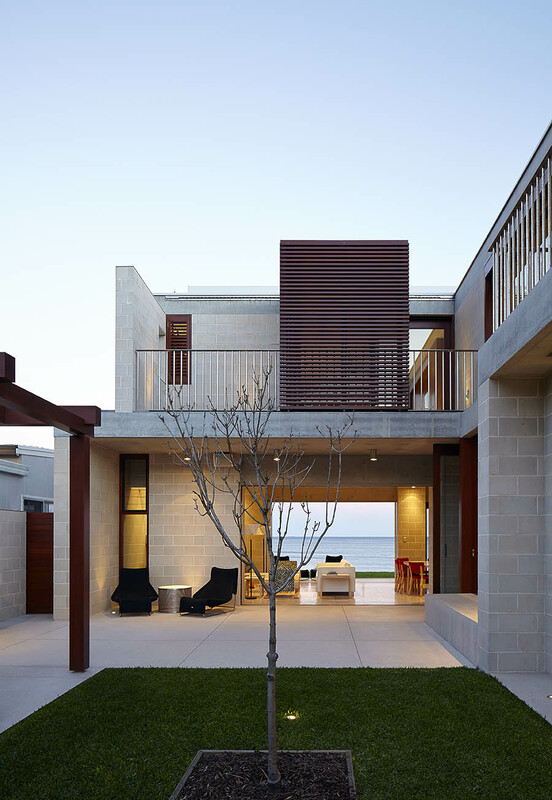 For example in our Block House at Pearl Beach (pictured above) , the central courtyard is defined by the two strategically placed wings, providing a private sanctuary and an enclosure protected from onshore winds. The courtyard provides consistent and controlled ventilation and sun access throughout the year. Another example our Mosman house which features two pavilions placed around a protected courtyard. The courtyard provides both ventilation and natural light to flow through the house. An interesting addition to the courtyard is the adjustable motorised aluminium louvres which form part of the saw-tooth roof design of the house and can be adjusted for sun and rain control. 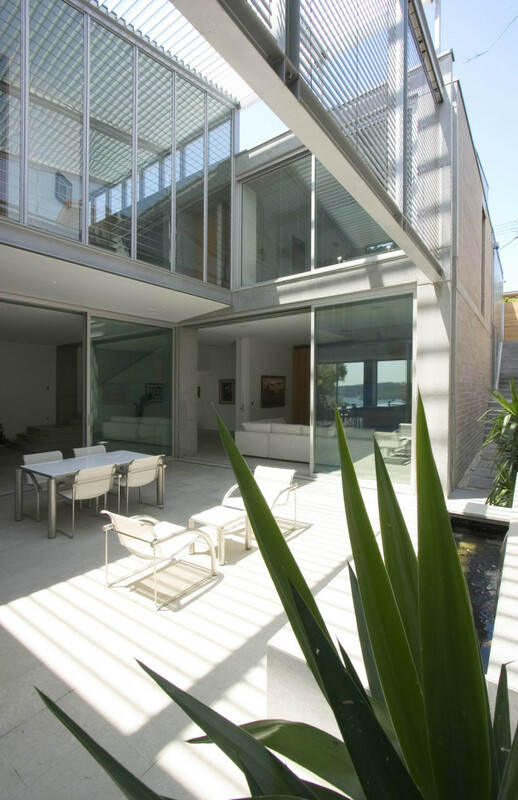 The inclusion of a courtyard is a great way of allowing light into the centre of a home on a east west facing block. Importantly the courtyard provides light and cross ventilation to multiple sides and allows great flow inside and out, perfect for our current way of living.